This is one of my alltime favorite hat designs. This beautiful hat was made in a bright green dupioni silk fabric. Green/gold peacock feathers are placed around the entire brim and a gold cording circles the base of the crown. 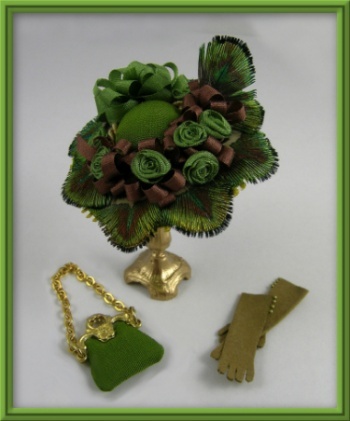 The hat is paired with a matching silk purse and a pair of brown leather gloves. Purse and glove patterns and instructions are also included in the packet.